Were there any particular mentor texts that inspired you in the creation of Hedgehog Needs a Hug (or any other upcoming books)? Yes! I’d gotten to a point in my manuscript where the basic text on each page was there, but it needed a lot of polishing. My agent told me to work on showing emotion, without telling it. For example, an early draft of the story said “Hedgehog woke up feeling blue.” It later became “When Hedgehog awoke in his cozy nest, he felt down in the snout and droopy in the prickles.” As an author-illustrator I had to find the right balance between showing the emotion in the images and showing it in the text, and I tend to rely too heavily on the images, when sometimes a few additional words can make a big difference. 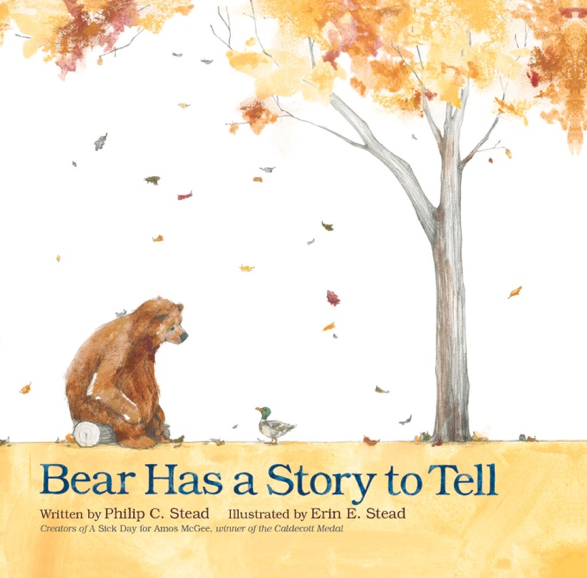 Bear Has a Story To Tell uses descriptions of physical posture to signal how the character feels. While some of this can be shown in the illustrations, these descriptions add a layer that might not otherwise come across. The emotive language in this book is so subtle – and it’s a story about death. There were just a few descriptions like, “taking a deep breath,” or “he sighed”. Otherwise it involved word choice of using words like remember, tired, or together to imply the impending separation. 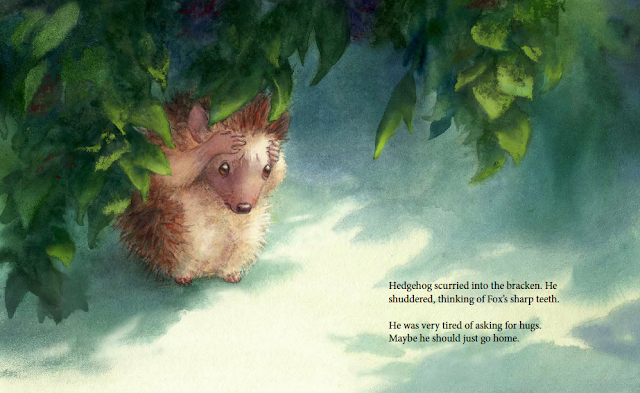 “Nevermind,” Hedgehog sighed, and he shuffled away. I think there are two ways I approach mentor texts: general and specific, and I think both are beneficial. 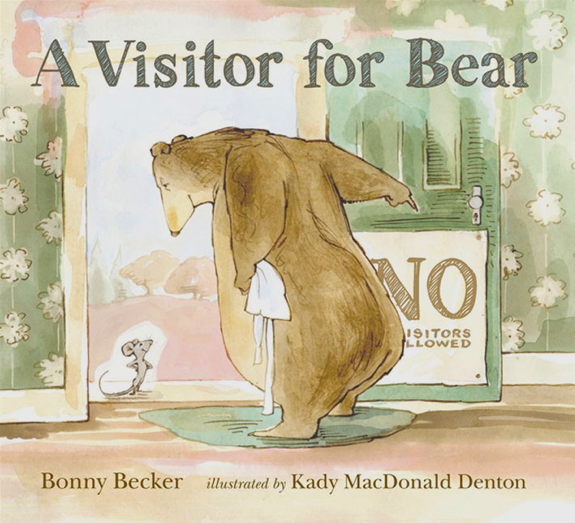 General: I often pick up picture books I’ve seen online or at random and just read – this helps me 1) be aware of the current market, 2) have a subconscious feel for the type and structure of story that works, and 3) is just fun. Specific: often I have a problem that I’m actively working on – like using emotional language. And so I’ll go hunting for books that showcase that skill, and I’ll study the words in more depth. These books I’ll type out – copy the entire manuscript – because it’s easier for me to concentrate on the words that way. You can’t go wrong immersing yourself in picture books! These are great examples of showing emotion. Thanks, Jen! Thanks Tina! So glad they were helpful! This is such a great post! Thanks for sharing, Jen. 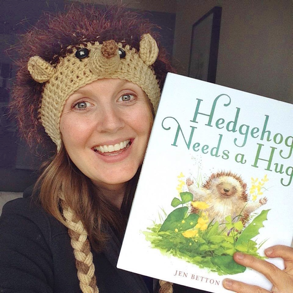 Congratulations on Hedgehog Needs a Hug! Can't wait to read it. Thank you Rita! I'm glad you enjoyed the post. What a beautiful book. Congrats! And thanks for sharing some of your process with us. Thanks for joining us on ReFoReMo, Jen!!!! ADORE your book! Yay!!!! Thank you for having me - such a great resource!! So pleased to be able to contribute to it. This mentor text post is easy to understand and packed full of good examples to work from in our own writing. Thanks Sherri! I'm glad the examples were helpful! What a sweet premise. And I always struggle showing emotion through words too. You have great examples. It is interesting that an author/illustrator goes through this. I always figured if I was an illustrator (which I'm not) I could just draw it, so I'm surprised that's not the case. I love the droopy prickles. You nailed it. And the hat is precious. Can't wait to read your book. Thanks for the insights. I know, I always think I can just show it in the pictures!!! But it makes it sooo much better when I add emotion to the words, too! Glad you enjoyed the examples. Super choices, here, for emotion. 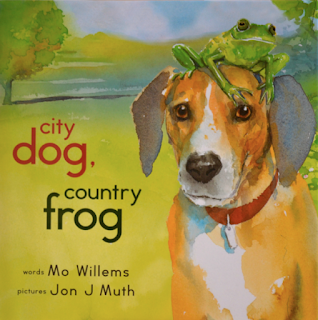 My fave is CITY DOG, COUNTRY FROG. I adore that book. Yours looks fabulous, too. Ty for a great mentor lesson and congrats on HEDGEHOG. Isn't CITY DOG such a sweet book - totally made me tear up the first time! And thank you! Really helpful post, Jen! Thanks! Thanks Charlotte! I hope you enjoy the book! Great post! I love that you showed exactly how mentor texts guided the revisions of your own PB! Couldn't have done it without mentor texts! Great post... huge fan of all your mentor text choices and will go reread as I am just crafting some emotive text now! I love these books - hope they help you too! Love that you provided us with the mentor texts you used, Jen...and told us what each provided. It was really eye-opening to read about the words that were used instead of 'said'...I can't tell you how many times I've heard pros instruct us to use only 'said' and 'ask' as speech tags. But obviously, other verbs can sometimes be used with great effect! THANK YOU!!! Yay! Glad it was helpful! Yes, reading A VISITOR FOR BEAR is such a manual of alternatives for "said"!! Wow this is amazingly helpful with a ms I am working on. Thank you so much! Excellent post Jen. Love your examples and explanations. Thank you Emma - glad you like it! And that picture is one of my favorites from the book. Excellent examples! Your sharing brought to mind a project I'm working on. Someone suggested I take OUT similar words used in your examples. Glad that I decided to ignore that suggestion! Thank you! Thanks for these great examples, Jen. They really show how altering text makes such a difference. Especially the turtle scene. 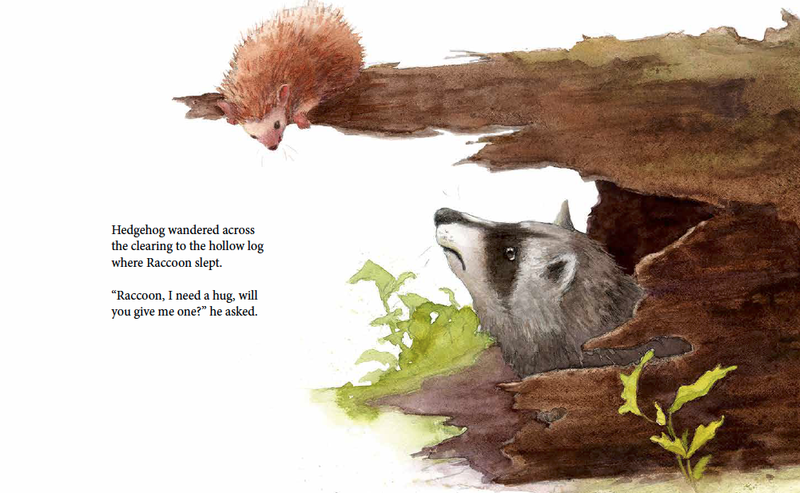 It's fascinating that as an author-illustrator, you lean heavily on your images to tell the story, vs the text itself. Alas, my stick figures are pretty un-emotive :)I'll definitely check out the books you mentioned above, too. Can't wait to read Hedgehog! Thanks for sharing your mentor texts for bringing more emotion into your work.